A study published in the Journal of the American Medical Association (JAMA) Thursday reveals that 21 of the Americans complaining of hearing loss, balance problems, and other cognitive issues after working at the U.S. Embassy in Cuba suffered “widespread brain network dysfunction” of an unknown cause. The study also dismisses the possibility that group panic triggered psychological symptoms that do not have a physical origin. The Cuban government has insisted that its own studies show the individuals in question panicked over sounds Havana claims were made by insects and suffered phantom symptoms. University of Pennsylvania researchers note, however, that they have no proof that the sounds the diplomats and their relatives heard in Cuba were related to the symptoms they later suffered, and that there is no scientific evidence for sound waves in the audible range to cause physical damage. Researchers examined 21 of the 24 known victims of this unspecified attack (three of those involved refused to participate). Of those studied, 18 of them said they heard “a novel, localized sound at the onset of symptoms in their homes and hotel rooms.” The sounds were “intensely loud,” the victims said, and most were high-pitched. Those who did not hear sounds said they experienced similar symptoms to those who did. Three individuals suffered such severe hearing loss that doctors have fitted them with hearing aids. “The pattern of conventional imaging findings in these cases was nonspecific with regard to the exposure/insult experienced, and the findings could perhaps be attributed to other preexisting disease processes or risk factors,” the study notes. Some patients also exhibited anxiety, depression, and post-traumatic stress symptoms, which doctors considered within expectations given their current physical state. While the researchers have provided much more detail than previously available on those affected by the situation in Havana, they offered no clear conclusions. They dismissed many, however. They argue that the patients are likely not suffering from any chemical poisoning. They also do not have concussions, as their MRIs scanned clear and their symptoms are too intense to be attributable to it. Doctors also note that the physical damage “could not have been consciously or unconsciously manipulated” by fear or politics. The fact that most patients “were largely determined to continue to work or return to full duty, even when encouraged by health care professionals to take sick leave,” indicates they were not fabricating their symptoms. The closest it gets to a culprit is to warn that “a novel mechanism of a possible acquired brain injury from a directional exposure of undetermined etiology” could be to blame. 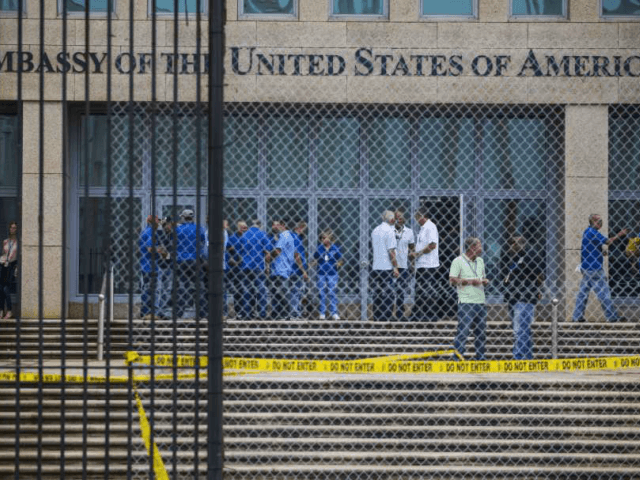 The U.S. State Department has repeatedly referred to what has happened to these embassy staffers as an “attack.” Cuba has a history of using shrill sounds to torture its own dissidents, according to at least one former political prisoner who testified to being tortured in this way. The communist Castro regime, however, has referred to the incidents as “science fiction” and broadcast a documentary on state television in October claiming that American diplomats are unfamiliar with the sounds of Cuban insects, and panicked at the sound of cicadas and crickets. “Cuban investigators proved, through a deep study, the similarities between the sonic examples handed to them and the sounds of these insects,” Communist Party newspaper Granma reported. The Cuban government has yet to respond to the JAMA article at press time.